These restaurant Seafood Recipes are not served to customers who are seated over-looking an ocean but I do sell more seafood...especially salmon, Alaskan halibut, crab, prawns and shrimp and cod ...than most other restaurants for miles around, even those with a water view. Seafood for breakfast, lunch or dinner. Diners today understand the nutritional value of some seafood (low carbs, high protein, healthy fat). Seafood is versatile. It can be used as a main course or as an appetizer, a spread, or a salad or sandwich. These restaurant recipes specify only quality seafood and that helps deliver fabulous taste while enhancing health. Thanks for "the Biz," Maureen! These restaurant seafood recipes use fresh product when quality fresh is available. Do not buy fresh fish any sooner than you absolutely have to. Refrigerated and iced-down, it can be stored for only about two days. 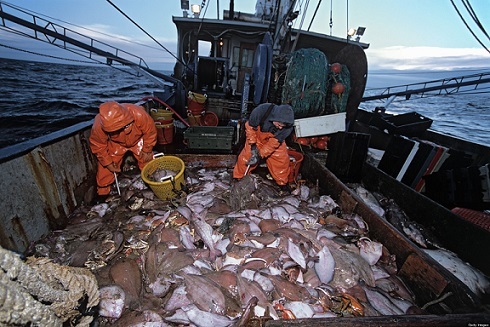 I really recommend you buy seafood harvested from deep clean waters. When fresh is unavailable I use the best "fresh frozen" seafood and smoked seafood I can find. "Fresh frozen" simply means the product was "flash frozen" within an hour or two of being harvested. Breaking News! Many of the Real Restaurant Recipes are now available in e-cookbooks or beautiful, full-color 8X11.5 inch paperbacks! Just click here. Of the five species of salmon, these seafood recipes use only King (also called Chinook) or Sockeye (also called Red) salmon for most entrees because both are prized for their red flesh, rich flavor, high oil content, firm texture and great eye appeal. I believe Chum (or Keta) salmon and Pink (or Humpback) salmon should only be used in certain recipes. Both are good when smoked. Both species have pink flesh and moderate fat content. This seafood pasta salad recipe calls for Penne' pasta for eye appeal and two other very nutritious ingredients: smoked wild salmon and fresh asparagus! Preparation time: 45 minutes, but pasta salad should be chilled for at least one hour when finished. This pasta salad recipe serves 6-8 people depending on portion desired. The salmon potato casserole recipe is easily a "stand alone" meal but is especially good when enhanced with a salad or Cole Slaw. Preparation time: 40 minutes. Serves 4-6 depending on desired portion. This is a favorite restaurant recipe. I love to prepare wild Alaskan salmon fillets this way. Preparation time: 20 minutes. Serves 4. This seafood restaurant recipe is versatile. You can use either salmon or halibut. The recipe is quick and easy but...Oh... SO GOOD! Preparation time: 15 minutes. Serves 4. 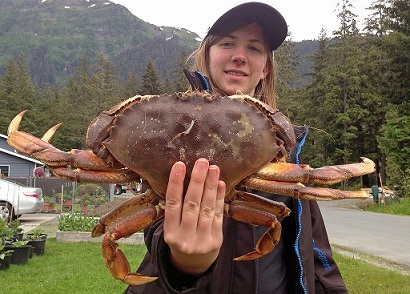 One of my nephews is a fisherman in the deep, cold waters off Alaska. This Glazed Salmon Recipe is dedicated to him and all those brave souls who harvest wild seafood for our dining pleasure and our nutrition. Thanks nephew. Preparation time: 5 minutes. Serves 4. Simply fast, simply DELICIOUS seafood restaurant recipe. Use King or sockeye salmon PLEASE. Preparation time: about 10 minutes. Serves 4. This easy grilled salmon restaurant recipe uses a delicious lemon herb butter to enhance the flavor of the salmon. You can use the same ingredients and oven roast your salmon fillet or salmon steaks if you prefer. People love the fish prepared either way, especially when topped with lemon herb butter. Preparation time: 10 minutes. Serves 4. I sell as much halibut as salmon. Halibut is a naturally lean and light fish, combining a sweet, delicate flavor with firm texture and a pure, snow white flesh. The distinction between prawns and shrimp can be confusing. In some places the bigger species are referred to as 'prawns' and the smaller as 'shrimp'. (I use this definition). In other areas this differentiation is the other way around. The prawn recipes usually specify size as being 21-25 count per pound. LOVE at first bite! Serves 6 as an appetizer. Ah...this seafood recipe is a REAL favorite restaurant recipe! Preparation time: 20 minutes. 4 servings. Shrimp has become America's most popular shellfish. Because of its sweet, delicate flavor I feature Pink shrimp in my restaurant seafood recipes including appetizers, quiches, salads, seafood sautés, bisques and omelets. Pink shrimp can also be heaped on top of pasta, tucked into enchiladas and crêpes or added to stuffing and sauces. 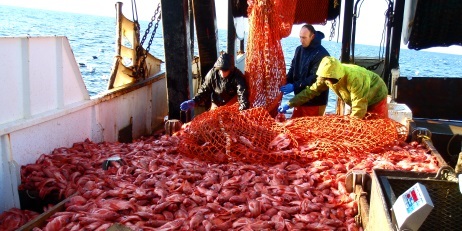 Pink shrimp averages between 300-500 peeled shrimp per pound. It is usually marketed in one-pound and five-pound units. Restaurant guests absolutely LOVE this shrimp sandwich recipe. Preparation time: 20 minutes. Servings: Cream cheese is enough for 8-10. Restaurant customers like their fish mild, moist and flaky. That's why cod with its fresh-caught flavor has become a popular item. Low in calories, cod is an excellent source of high-quality protein and essential nutrients. Cod has proven ideal for a wide range of seafood recipes and cooking methods. As with most seafood, it can be baked, poached, steamed, sautéed, grilled or deep-fried. Fantastic tasting fish you and your family will love. The restaurant guests certainly do. You can use halibut or cod for this seafood restaurant recipe. Preparation time: 15 minutes. Serves 5-6. If you like spicy, you'll love this blackened fish restaurant recipe. Be warned ...it creates a lot of smoke. Preparation time: 30 minutes. Servings: 6. Dungeness Crab is one of the best. 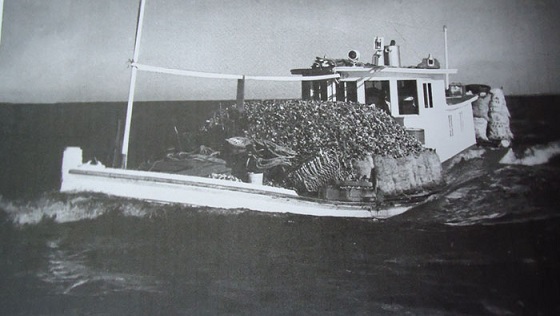 Dungeness Crab is harvested all along the western U.S. coast. Available precooked, this shellfish has a distinctive sweet flavor, bright orange shell color, and tender, flaky white meat. These restaurant seafood recipes use Dungeness Crab meat for crab cocktails, in crisp green salads, in stews and soups, in appetizer dishes and as entrées because it combines well with a myriad of seasonings and sauces. This restaurant seafood recipe creates one of the best selling appetizers ever. Dazzle your family and friends with this restaurant seafood recipe for breakfast, brunch or lunch. Serve this casserole with a variety of fresh fruits and sliced avocado or a wild green salad tossed with avocado and a balsamic vinaigrette dressing. The restaurant guests like scallops in sautés, stir fries, pasta dishes, appetizers, salads and “combo” plates. Eating raw seafood has existed since the beginning of time, but I have never been able to enjoy doing so. If I am to eat oysters, I need them cooked. Although I believe different oysters are really all the same species, different oysters do have distinct attributes, depending on where they were raised or grown. The finest Oysters are cultured at farms where ocean currents naturally replenish the supply of the food (nutrients) needed by oysters. I am told that a constant exchange of cold salt water called "up-welling" is key to the quality of cultured oysters. The impact of this variable is why oysters are frequently named after the places where they were raised. Oysters are traditionally served six to a plate for an entree, frequently set in the lower shell around slices of lemon (occasionally lime). For some oyster lovers, adding other condiments (cocktail sauce, Mignonette sauce, hot sauce, Worcestershire, horseradish) just shouldn't be done, fearing the flavor of the oyster will be masked beyond recognition. For me and most of the people I know, oysters can be enjoyed grilled, steamed, pickled, canned, stewed, roasted, fried, baked, boiled and smoked. To me, whatever condiments accompany the oysters often depends on how they are cooked. With Lemon Herb Butter and either Cocktail Sauce or Champagne Vinegar Mignonette Sauce. Preparation time: 30 minutes. Serves 6. Lobster is now one of those seafoods not many of us can afford, or at least not very often. And that is a true irony since lobster was once considered a poor man's meal. Wow, things have changed! Lobster only became a popular dish in American about a century ago. Prior to that, eating it was considered proof that you were very poor. It was, in fact, fed to slaves and members of the lowest class. And it was, for a time, even used by farmers to fertilize their fields! With the coming of more modern (quicker) transportation that could accommodate the shipment of live lobsters to large urban centers on the east coast of America and then beyond, lobster became a luxury food - and expensive. Lobster is delicious simply boiled or steamed and served with clarified butter. You can also broil or bake and grill lobster, but boiling or steaming are the easiest. And when lobster is paired with steak ( "Surf and Turf" ) the meal is one of the easiest and most delicious dishes there is. Many people, if not most, will tell you fresh (live) lobsters are the best. I don't disagree, but I prefer buying and preparing only lobster tails. The reasons are simple and practical: I do not want the hassle of cooking live lobsters and the restaurant customers do not want to deal with nutcrackers and "fighting" for the meat, and most of the meat is in the tail to begin with. These same people will tell you that freezing the lobster tail may toughen the meat. Quite possibly, but I have found that a careful cooking process all but negates that criticizm. You can read about Cooking Lobster Tails by clicking on that link. This is one seafood that the east coast of America and Canada "bests" the west coast. 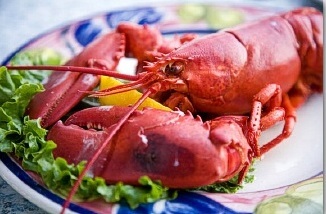 There is no doubt that the best lobster comes from the cold waters of the Atlantic coast off America and Canada. Second choice, lobster from certain parts of Australia and New Zealand cold waters. Thanks for visiting and for your interest in seafood recipes from a restaurant that allow you to cook with confidence and style! Enjoy your seafood recipes and the company of those you share them with!